In the mid-1970's, Americans were in a pretty bad mood. Although the Vietnam War had ended a few years earlier, there was still a great deal of bitterness among those who were drafted to fight that divisive war, particularly given the outright unappreciative treatment those veterans received upon their return home to the country that drafted them. Beyond that, there was a not-so-little matter of the 1973 OPEC Oil Embargo which lead to rationing of gas and oil that was still fresh in people's memories. In fact, I can remember waiting in the long lines at the gas pump with my Mom, and the fact that we had to plan around the days that we could actually buy gas (the government rationed fuel purchases based on the last digit of people's license plates, so even [and odd] numbers could only buy gas every other day). But average cars were not very fuel efficient, so it was a big deal at the time. There was also a feeling of disgust with the Federal government, since President Richard Nixon had resigned just a 3 years earlier after the Watergate scandal (news of that was broken by two young reporters for the Washington Post named Bob Woodward and Carl Bernstein who recently wrote that the deceptions and lies they uncovered were actually worse than originally believed, see that article at http://wapo.st/LulCz4). As a result, many Americans weren't feeling particularly patriotic, and with good reason. In short, people were p!$$ed off and felt the nation's leadership was unable to manage much of anything. Yet Congress felt the time was right for the country to celebrate, and what better reason than the nation's 200th birthday, or the "bicentennial"?! There was a debate about what the country should do, as some argued that events should really be held in either Boston or Philadelphia, but in the end, a decision was made to allow local events to be held across the country, which in hindsight, was actually a wise decision. Besides, Boston and Philly weren't the only places involved, as many other places played important roles in making the American "revolution" happen. The U.S. 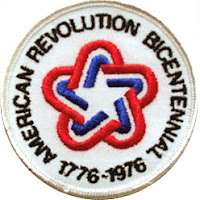 Bicentennial was a bunch of celebrations and observances that paid tribute to the events leading up to the birth of the U.S. as an independent republic. It culminated on Sunday, July 4, 1976, with the 200th anniversary of the adoption of the Declaration of Independence. At the time, I was just seven or eight years old, so much of it is a somewhat vague memory. I seem to recall a discussion of it in my first-grade class (before we left for summer break! ), but my recollections were of stuff like the history lessons. I do remember picnics on the 4th, however (I spent the 4th in the Seattle area with my uncle, aunt, cousin and grandmother)! But the celebration went beyond this. All over the country, cities were painting things like fire hydrants red, white and blue, and there were many other things intending to recognize the anniversary. Notably, my first grade class picture had a flag featuring only 13 starts (for the original 13 colonies-turned-states, along with "76" noted, see the photo at the bottom). Some stuff lingered for quite a while after! On March 30, 2010, ABC News digitized a piece of it's historical news coverage of Americans' Bicentennial Celebrations on the nation's 200th birthday (July 4, 1976) with the various parades and parties. It's a nice piece if you can tolerate the annoying singing in the early part of the news clip, which is narrated by former news anchor Harry Reasoner. 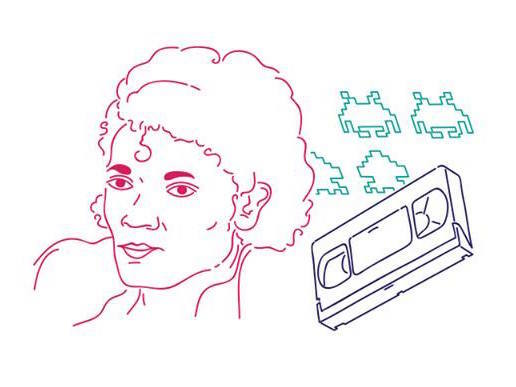 A short movie tribute to the country's 200th birthday funded by a Bicentennial Project Grant was animated by Vincent Collins (who made other psychedelic cartoons). The film's producer was Deborah Lastowka. This film was produced by the United States Information Agency ("USIA") which existed from 1953 to 1999. The USIA was devoted to "public diplomacy", particularly outside the Untied States. But in 1999, USIA's broadcasting functions were moved to the newly created Broadcasting Board of Governors, and USIA's functions were folded into U.S. Department of State. In any event, the USIA produced this short (but fun) clip called "200" which is arguably a very "trippy" tribute to our country's 200th birthday which came out in 1976! (It has a look from the drug-laden 1960s reminiscent of The Beatles' "Lucy in the Sky With Diamonds", but I digress). Vestiges Still in Our Pockets? Beyond this stuff, there was an official "logo" (see above) which was a star made from red, white and blue ribbons (although the British flag is also red, white and blue, so in hindsight, that choice didn't seem particularly "independent") for the bicentennial, which I recall mainly because of the postage stamps which featured it (this was pre-email, folks!). Even today, you might still have al remnant from the bicentennial in your pocket: the Treasury issued coins with special designs as part of the Bicentennial. 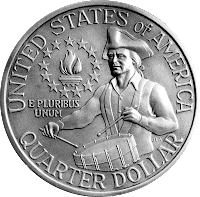 An open contest was held to select the designs for the quarter, half dollar, and silver dollar and reportedly, more than 1,000 designs were submitted. 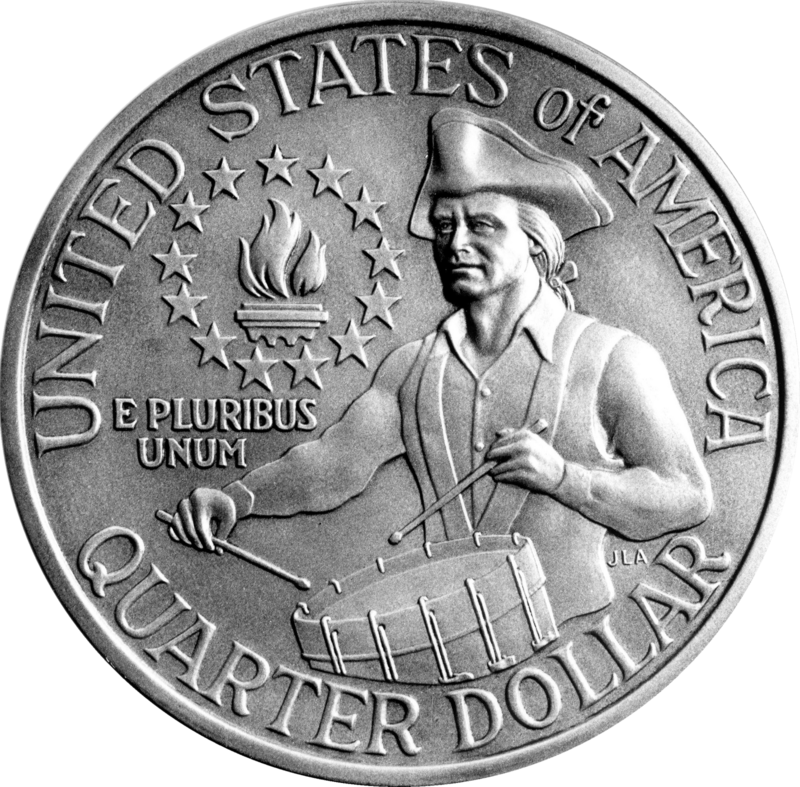 The quarter featured a colonial drummer and a torch encircled by thirteen stars, the half dollar had Independence Hall, and the silver dollar had the Liberty Bell superimposed over the Moon. These coins bore the date "1776-1976." Elementary schools, including mine, also commemorated the Bicentennial with special, flags with '76 emblazoned on them and stars for each of the 13 colonies-turned-states. As I understand it, that was permitted by the Bicentennial Committee that coordinated the events around the country. Yes, I'm one of the kids in this class picture!